This lab is an introduction to the microscope. We’re going to cover how to use a compound microscope, the basics of optics, slide preparation, and why we can see things that are invisible to the naked eye. What’s a compound microscope? Compound microscopes are basically two lenses put together to make things appear larger. If you’ve ever used magnifying glass, you’ve noticed how the lens makes words easier to read. If you were to look through two magnifiers (one stacked on top of the other with space in between), you’ve seen this effect multiply to create an even larger image. That’s exactly what a compound microscope does. It uses stacked lenses to greatly increase the magnification. I’ll show you how to get the most out of your investment by learning how to operate a microscope and prepare specimen slides. Click here for a printer-friendly version of this page. The first thing you need to do is select a compound microscope. Cheap microscopes are going to frustrate you beyond belief, so we’ve provided recommendations that will get last your kids through college. 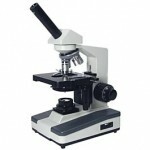 It can be a daunting task to find high quality microscopes and accessories at affordable prices. 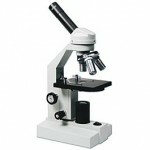 Here are a couple of recommendations for microscope and equipment that will last your kids through college. You’ll also need additional items like slides, coverslips, tweezers, and other basic equipment. 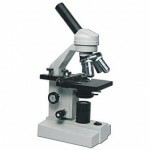 Economy Model: The Kids Microscope is a great entry level microscope for under $110. 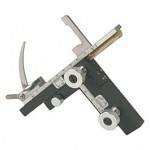 It meets the optical requirements to do our microscope labs but has only single intermediate focusing. It is also available in a cordless LED model that you can use in the field. If your children are young, this may be a good scope to start out with. 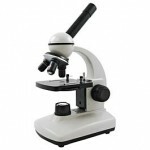 Student Model: The Home Microscope is an excellent 5th – 12th grade level microscope with fluorescent lighting that will really meet all the microscope needs of most families. It is well built with very good optics and will stand up to many years of use. I recommend the additional mechanical stage, as stage clips can be frustrating when working at high power! Advanced Model: There is a Serious Student Model that includes the mechanical stage, iris diaphragm for lighting control, extra 100x oil immersion objective for 1,000x magnification, and immersion oil. This one will take you far in your studies of the micro world. Using the 100x objective with immersion oil is more challenging but also very rewarding as your child is able to see more and develop advanced microscope skills. All-the-Bells-and-Whistles Model: The Ultimate Home Microscope is really a great microscope (and very similar to the one I personally use with the teaching head attached). 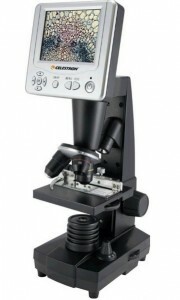 This is a university/lab level microscope that is built to withstand the rigors of daily use. This scope is heavier, sturdier, and has all the advanced features like 100x oil immersion objective, iris diaphragm lighting control and a mechanical stage with very easy to use controls. It is also available in a binocular model that is more comfortable to use.When your microscope arrives, keep it in its packaging until you watch the next video. I’ll show you how to handle it, store it, and where not to touch. No matter which microscope you select, you’ll want to be sure it meets these criteria: at least three objectives (40X, 100X, 400X) and the optics are all glass to provide better quality images and the microscope frame construction is metal to provide the durability you want. Most microscopes include a dust cover and custom fit styrofoam box for safe storage. Optional additions include a mechanical stage (which we highly recommend), a fourth 100x objective lens (for 1,000x magnification), and adjustable iris diaphragm for better lighting/contrast control. By the way, if you’re considering the the fourth 100x lens, make sure you get the special “oil immersion” objective. Light tends to do weird things when you magnify it that much, and to avoid these kinds of problems, scientists use a drop of oil on the slide to connect the objective with the slide. However, you can’t do this trick with just any objective lens – you need to have a special kind of lens that won’t get mussed up when contacted with oil (hence the “oil immersion” type). Prepared Slide Sets: Using our labs you will learn to make different kinds of microscope slide mounts and examine a variety of samples that you can easily collect. 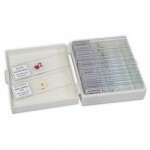 Prepared slides contain specimens that have been professionally stained and prepared so that you can expand your microscope studies to a great variety of plant and animal life that you would otherwise not have access to. The general slide set and the biology slide set are two sets that contain a great variety of specimens to expand your microscopic studies. Microscope Case: While the dust cover and styrofoam box that come with your microscope provide a good degree of protection, you may want to consider a microscope case to provide greater protection and convenience in carrying and storing your microscope. 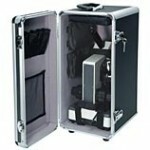 These cases have the added advantage of also storing your microscope accessories with your microscope in one location. Digital Microscope: This one is actually cheaper than most optical models listed above, and I’ve used it when teaching kids. The best part is, all kids can view at the same time, and you can take both pictures and video of your specimens while viewing. It’s really a great deal for the price. The one I really like is the Celestron 44340 LCD. I’ll show you how to build a very simple microscope using two handheld magnifying lenses! All you need is an afternoon, a few kids, and two magnifiers per kid. Now it doesn’t come close to any of the microscopes above, but it will allow you to do some basic experimentation. (The magnifiers do not need to be the same magnification.) Gather up a few coins, dead bugs, and plant specimens and you’ll be all set for a microscope adventure. It’s a microscope that a lot of schools use based on how durable it is and that kids can’t really break it (which is good for kids that are typically hard on equipment). You can get one from the teacher’s resource area here. In the field, I personally opt to use one that has a few more parts to it so kids can really get a sense of how to use the compound microscope they will encounter later in school, and with the right kind of kids, one that also has more flexibility in lighting. The one you mentioned only has a fiber optic-like tube to pipe in light. I prefer one with adjustable mirrors, as sometimes you need more light and other times less light, but if your kids get frustrated easily and don’t have patience to fine tune things (like adjusting the mirror angle), then I’d go with the first scope. Either way, it’s a decent enough scope to use with the lessons in e-Science. Do you have any thoughts about the Brock Magiscope? I like the idea of taking it out in the field but also want to make sure it is suitable for most microscope situations needed for our Supercharged Science lessons. We got ours from the local toy shop – you can do a search online for “bug box magnifier” and you’ll find them. I also use film canisters and baby food jars to store neat things in as well. We’ll be posting a lot more labs for microscopes this summer, so keep an eye out for them! 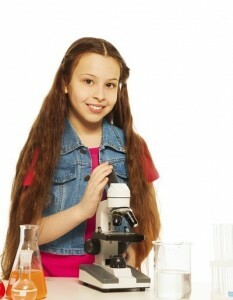 I am planning to do a microscope lab with my sixth grader this summer (along with summer e-camp). I am getting all my supplies ready now and I need a little help with one item . WHERE CAN I GET THE LITTLE PLASTIC BOXES that you talked about in your video FOR LITTLE CRITTERS WE FIND? If your student is ready for deeper studies in the micro-world, then this section will also provide them with everything from microscope care, use, and studies (including how to purchase a microscope that will last long-term). We’re going to look at different methods of slide preparation and when to use which type of mount. The labs in this section cover a 2-week course appropriate for Jr High and High School. Do I really NEED to have a microscope to do this lab? ?